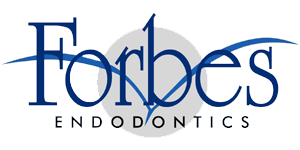 At Forbes Endodontics we specialize in root canal therapy. The most common symptom that may indicate the need for a root canal is tooth pain. If you have already been to a dentist, they may have recommended a endodontist specialist. When you come in for your appointment, we will examine your tooth and take X-rays in order to diagnose the cause of your problem. After proper examination, we will then be able to tell you the best course of action to resolve your symptoms. Root canals are performed when the nerve or pulp of the tooth becomes infected and inflammed due to dental decay. Root Canal Therapy (Endodontics) involves the removal of all infection from the root canal. During the treatment the infected pulp is removed. Any abscesses which may be present can also be drained at this time. The root canal is then cleaned and shaped ready for filling. A temporary filling is inserted and the tooth is left to settle for 2 weeks before a permanent crown can be applied. We will take every measure to ensure that your procedure is in no way uncomfortable or painful. If treatment is needed, we will inject a small amount of anesthesia to gently numb a concentrated area of your mouth. For most patients, the feeling of numbness usually subsides after 2-3 hours. We also offer sedation dentistry for those patients with elevated anxiety during dental procedures. Please click on the "Implants - Sedation Dentistry" tab under General Information for more details. The nerve may become damaged by bacteria associated with past or present decay, or by a traumatic blow. Root canal therapy allows you to keep the natural tooth in a healthy satate rather than substituting it with an artificial tooth. What if I do not have the treatment? The alternative to Root Canal Therapy is the removal of the tooth. Once the pulp is destroyed, it cannot heal and it is not recommended to leave the infected tooth in the mouth. While some people would prefer an extraction, it is usually advisable to keep as many natural teeth as possible. We will take x-rays during your consultation. If you have x-rays from your general dentist, please bring them with you. Dr. Forbes utilizes the latest Digital X-Ray technology. Digital x-rays are produced by computers. This allows the Doctor a fast and reliable way to determine the course of treatment you may require. Also, digital x-rays reduce your radiation exposure by 85% providing you with the assurance of safety and continuity. How long does a Root Canal treatment take? The Root Canal treatment usually can be completed in one visit. In some cases a second visit is required. Please allow 2 hours for your office visit. What do I do after my Root Canal treatment? You will be given instructions by the staff after your treatment. If you are given pain and/or antibiotic medications, please take it as directed. Do I need a crown on the treated tooth? Yes. Although the temporary filling you will receive will last between 3 to 5 weeks, we do not advise you to wait longer than is necessary for your permanent crown. After 2 weeks, if your tooth feels fine, you will need to see your general dentist. He will provide you with several options concerning permanent crowns that are available. What if the tooth continues to be uncomfortable after several weeks? Root Canal treatment is usually very sucessful, however, if there should be a recurrence of infection, the treatment can be repeated.